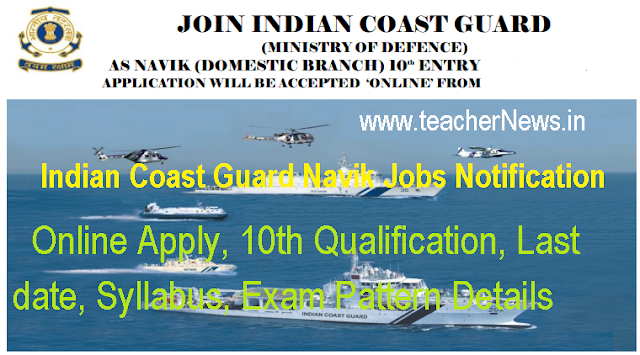 Indian Coast Guard Navik Jobs 2018 – 10th Qualification, Apply Last date, Syllabus, Exam Pattern and more details at joinIndiancoastguard.gov.in. Indian Coast Guard, an Armed Force of the Union has invited Online Application for Navik (Domestic Branch) 10th Entry 01/2019 Batch for Cook & Steward. Indian Coast Guard Invites Online Application For Navik (Domestic Branch) 10th Pass Entry – 01/2019 Batch. Indian coast guard navik db recruitment 2019 join Indian coast guard admit card Indian coast guard domestic branch salary, Indian coast guard domestic branch exam date, Indian coast guard application form download, Indian coast guard domestic branch syllabus, Indian coast guard navik merit list, Indian coast guard db merit list. (i) Cook : They would be required to prepare food as per menu (both vegetarian and non-vegetarian including handling of meat products) and accounting of ration. In addition, they will also be allotted other duties for efficient running of the organization. (ii) Steward : They would be required to serve food in the officer’s messes as waiters, housekeeping, maintenance and accounting of funds, wine and stores handling, preparation of menu etc. In addition, they will also be allotted other duties for efficient running of the organization. పదోతరగతి విద్యార్హతతో భారతీయ తీర రక్షణ దళం (ఇండియన్‌ కోస్ట్‌ గార్డు) నావిక్‌ పోస్టుల భర్తీకి ప్రకటన విడుదలచేసింది. వీటికి రాత, దేహదార్ఢ్య, వైద్య పరీక్షల ద్వారా నియామకాలు చేపడతారు. ఎంపికైనవారికి శిక్షణ ఉంటుంది. అనంతరం కుక్‌, స్టివార్డ్‌ హోదాల్లో డొమెస్టిక్‌ బ్రాంచిలోకి తీసుకుంటారు. ప్రారంభంలో రూ.21,700 మూలవేతనంగా చెల్లిస్తారు. అన్ని అలవెన్సులు కలిపి మొదటి నెల నుంచే రూ.35,000 వేతనం రూపంలో పొందవచ్చు. Applications will be accepted Online only from 15 to 29 Oct 2018 login at official website http:/joinIndiancoastguard.gov.in/. Candidates Passed Class 10th (High School) Exam with 50% Marks and SC / ST Candidates 45% Marks. Basic Pay Scale for Coast Guard Navik (DB) is Rs. 21700/- (Pay Level-3) and Dearness Allowance and other allowances. 18 to 22 years (As on 01 Apr 2019) born “between” 01 Apr 1997 to 31 March 2001. Written Test will be in English. Candidates who qualify written exam will be called up for Physical Fitness Test then will be called for Medical Test. Medical Exam will be conducted by authorized Military Doctors. Height – Minimum height is 157 cms. Chest -Minimum expansion 5 cms. (a) Northern Zone (Noida) : Jammu & Kashmir, Himachal Pradesh, Punjab,Haryana, Rajasthan, Uttar Pradesh, Uttarakhand, Delhi and Union Territory of Chandigarh. (b) North-Eastern Zone (Kolkata ) : Bihar, Jharkhand, Mizoram, West Bengal, Orissa, Assam, Sikkim, Meghalaya, Manipur, Arunachal Pradesh, Nagaland and Tripura. (c) Eastern Zone ( Chennai ) : Tamil Nadu, Andhra Pradesh, Telangana, Union Territory of Puducherry and Andaman & Nicobar Islands. Indian Coast Guard Navik Recruitment 2018 – 10th Qualification, Apply Last date, Syllabus, Exam Pattern, Physical Fitness Test (PFT), Medical Test and more details at joinIndiancoastguard.gov.in.